Since the concept of the OERu was first presented at the OER for assessment and credit for students open meeting in February 2011, all meetings have been streamed live on the Internet with opportunities for remote participants to engage in the breakout sessions and planning activities. All proceedings are recorded transparently in WikiEducator. The OERu has adopted the convention of referring to the year and month when citing specific meetings. For example, the OERu 13.10 Meeting of Partners refers to the 2013 meeting which took place in October, the 10th month of the year. Consequently this year’s meetings are referenced as the “OERu 17.10” meetings. OERu partner meetings are not conferences, but open implementation planning meetings. They are strategic planning sprints designed to produce outputs in a short period of time which are then refined and improved openly in the wiki after the meetings. Observers from institutions who are interested in joining the OERu network are welcome to participate in these meetings. The OERu maintains detailed records of all its meetings including video recordings of the plenary sessions. Visit our dynamic timeline display on oeru.org. OER for assessment and credit for students meeting, February 2011, hosted by the OER Foundation, Dunedin New Zealand. 1st meeting of OERu partners, 9 – 10 November 2011 hosted by Otago Polytechnic, Dunedin, New Zealand. 2nd meeting of OERu partners, 31 October and 1 November 2013, hosted by Thompson Rivers University, Kamloops, Canada. Transnational qualifications framework and articulation meeting, hosted by the Commonwealth of Learning, 4 November 2013, Vancouver. 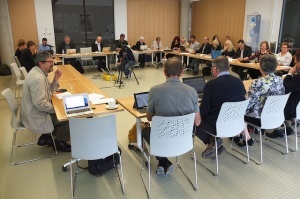 3rd meeting of OERu partners, 6 – 7 November 2014, hosted by the University of Tasmania, Hobart, Australia. 4th meeting of OERu partners, 7 – 8 October 2015, hosted by North-West University, South Africa. 5th meeting of OERu partners, 3 – 4 October 2016, hosted by the University of the Highlands and Islands, Scotland. Dr Alan Davis, Vice Chancellor and President of Kwantlen Polyechnic University serves as the current Chair of the Council. Alan is assisted by an executive committee of Vice-Chairs from the following regions: Europe – Prof Clive Mulholland, Principal and Vice-Chancellor, University of the Highlands and Islands; Africa – Prof Marthinus Oosthuizen, Deputy Vice-Chancellor, Teaching and Learning, North-West University; and Oceania – Phil Ker, Chief Executive, Otago Polytechnic. The CEOs meeting is conducted in camera, however agendas and meeting reports are published in WikiEducator. 1st meeting of the OERu Council of CEOs, 5 November 2013, hosted by Kwantelen Polytechnic University, Vancouver, Canada. 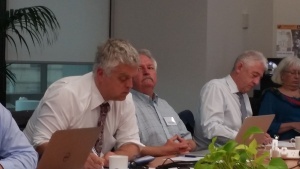 2nd meeting of the OERu Council of CEOs, 10 November 2014, hosted by the University of Wollongong, Sydney, Australia. 3rd meeting of the OERu Council of CEOs, 8 October 2015, hosted by North-West University, South Africa. 4th meeting of the OERu Council of CEOs, 5 October 2016, hosted by the University of the Highlands and Islands, Scotland.